After years of delays in producing its much-anticipated 787 aircraft, Boeing seemed in recent months to be turning a corner, streamlining production and increasing the pace of deliveries. But a pair of embarrassing problems last week revived concerns about the reliability of the plane, the first commercial aircraft to make extensive use of lightweight carbon composites that promise big fuel savings for airlines. A United Airlines 787 flying from Houston to Newark was diverted to New Orleans last Tuesday after one of its six electric generators failed midflight. That same day, the Federal Aviation Administration ordered inspections of fuel line connectors on all 787s, warning of a risk of fuel leaks and fires. Aviation experts cast these issues as minor hiccups and said it was typical for new planes to experience such problems, particularly in the first few years of production. On Monday, an aerospace analyst, David E. Strauss of UBS, raised another concern — whether the cost of building the planes was coming down fast enough for individual plane sales to become profitable by early 2015, as Boeing has projected. Boeing officials have said that the company will earn enough on subsequent sales to average a percentage profit in the low single digits on the first 1,100 planes, which includes deliveries into 2021. Company officials said late Monday that they remained confident in their projections. But in a research report, Mr. Strauss said that Boeing’s costs did not appear to be declining rapidly enough for sales to turn profitable in 2015 and that the program could continue to spend $4 billion to $5 billion more than it gained in revenue over the next three years. Unless the company can bring down the costs more quickly as it gains experience in building the planes, Mr. Strauss wrote, Boeing may not begin to make a profit on each plane until 2021. A lot is riding on the success of the 787 Dreamliner, a risky technological and commercial bet for Boeing, which is based in Chicago. The company has so far delivered 38 of the jets to eight airlines, including United Airlines, All Nippon Airways of Japan and Poland’s LOT. It has outlined ambitious plans to double its production rate to 10 planes a month by the end of 2013. It is also starting to build a stretched-out version and mulling an even larger one after that, to make the venture more profitable. The basic model, called the 787-8, can carry 210 to 250 passengers about 8,000 nautical miles, the distance from New York to Singapore, and has a list price of $206.8 million. Early customers, however, are receiving big discounts to make up for the delays caused by a series of manufacturing problems. The first stretched version for 250 to 290 passengers, the 787-9, is listed at $243.6 million and could be ready in early 2014. Mr. Strauss estimated that Boeing was recently spending $232 million to build each plane but charged customers, on average, only about half that. Given Wall Street’s concerns, Boeing’s stock has been in limbo for more than three years, trading in a narrow range around $75 a share. “Boeing has not had a major snafu on the 787 for over a year now, but we think most investors remain skeptical as to whether Boeing can keep this up,” Robert Stallard, an analyst at RBC Capital Markets, said in a note to clients last month. Boeing has acknowledged that it outsourced too much of the work on the plane to suppliers who were willing, collectively, to cover billions of dollars of the development costs. Many parts needed reworking. That and other design changes forced the company to set up a separate line in Everett, Wash., to handle the extra work on the first 65 jets. It has also built a 787 plant in Charleston, S.C., with an entirely new work force. Still, even with all of the headaches, the 787 has enabled Boeing to jump ahead of its European rival, Airbus, in exploiting the lightweight carbon composites. Half of the plane by weight is made with composites instead of aluminum and other metals. 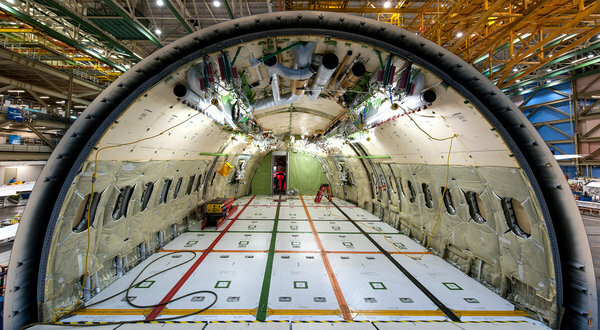 Airbus said last week that it had finished assembly on the first A350, its rival to the 787. Its entry into commercial service is not expected before the second half of 2014. Passengers who have flown on 787s this year have raved about the experience, and the first airlines using them also seem satisfied.